Kahaani: Pre-release opinion – Oh Calcutta! What is a pre-release review? – It is an opinion about a movie, about expectations BEFORE the movie is released. I hadn’t really thought I would ever write about a movie before even seeing it. But the Calcuttan in me (notice the archaic spelling!) could not resist. I was quite ‘taken’ by the trailer of the movie – it is distinctively Calcutta. Right from “Durga Pujo” to the Kolkata Police inspector in his trademark white uniform registering “Bidya”‘s complaint. While pursuing the research to know more about the movie, I also realized that I happen to somewhat know the script writer – Advaita Kala. We had met briefly last year through a common friend, she was just about launched her first book Almost Single, and she seems to have done pretty well for herself. She also wrote the script for Anjaana Ajnaani. 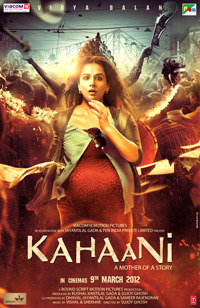 Kahaani has been directed by Sujoy Ghosh – ‘the man’ behind the distinctively Calcutta flavour of the movie, I guess. Some of the visuals are extremely pleasing – the ambassador taxis, the metro, the ‘dhak’ sound and the bells, the tram, the autos, victorial memorial, the narrow by-lanes.. I always seem to have an inexplicable eagerness to watch any movie based out of/shot in Calcutta. The familiarity and flavour is something that sticks deep. In fact, I don’t know why I seem to like watching this random Bengali movie called Bong Connection, which other than ‘Calcutta’ connection has nothing else to keep me too engaged! I guess it is the city – its like a magnet. Binds people together. Keeps you hooked to it if you have a connection. As is often said, cornily, you can take a man out of Calcutta, but you can’t take Calcutta out of a man. Applies to me. ‘Kahaani. : Bring it on! Here’s the official theatrical trailer on youtube. I too am looking forward to the movie. I hope a bengali director would have done justice and show bengali culture correctly instead of “eesshhh” and stuff. Previous Previous post: Krishan VS Kanhaiya: Classic Paresh Rawal!